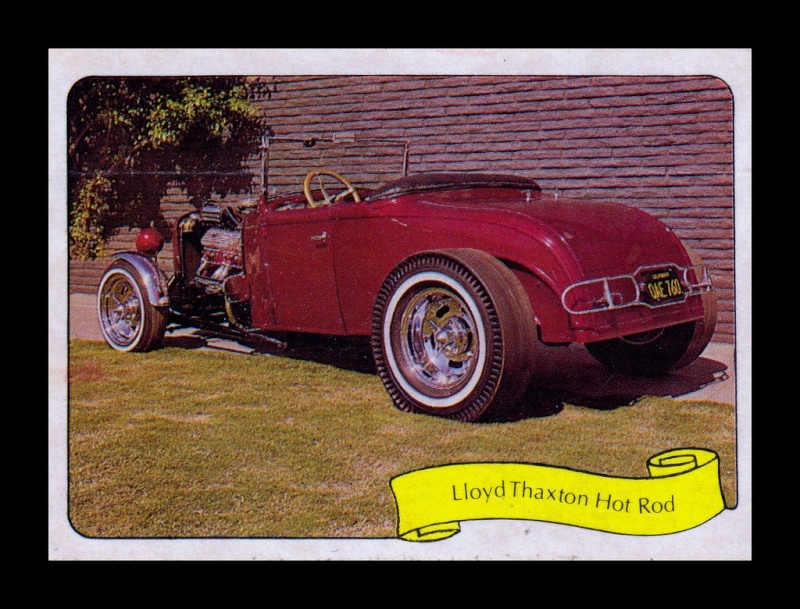 "This 1927 "T" Hot Rod was the Grand Prize winner at the National Roadster Show. The engine is a Dodge Ram 440 cubic inch with multi-carbs. 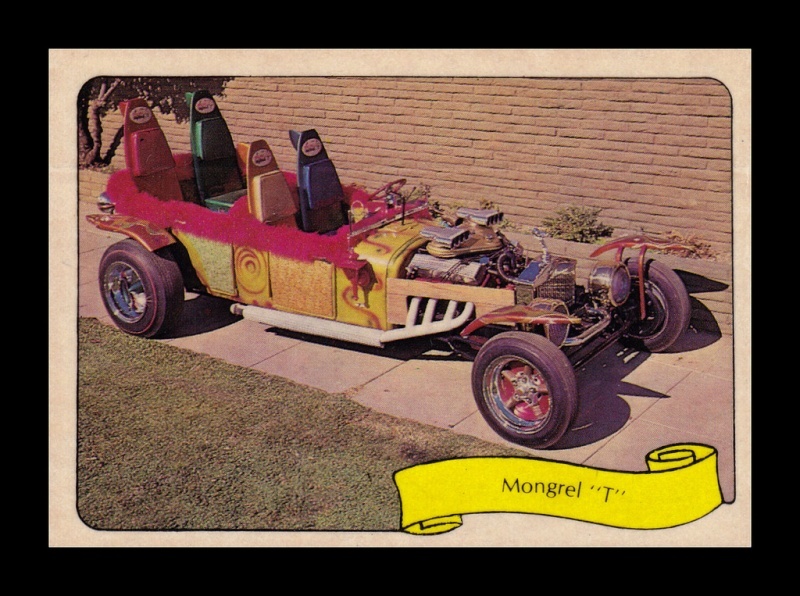 This prize vehicle is still owned by world famous customizer, george Barris." 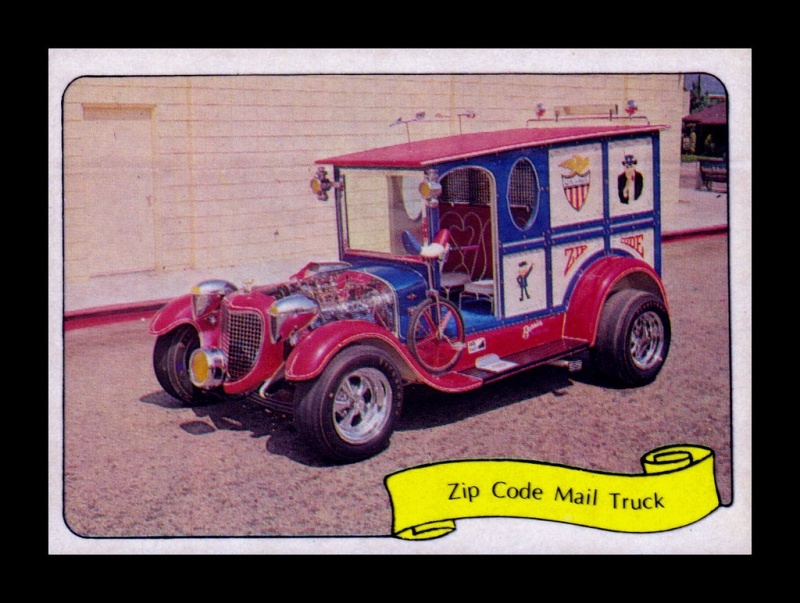 "This hot rod mail truck is equipped with a flat head engine and dual carbs, plus deep-set mag wheels. The seats are taken from soda fountains, and the paint job is a patriotic red, white, and blue." 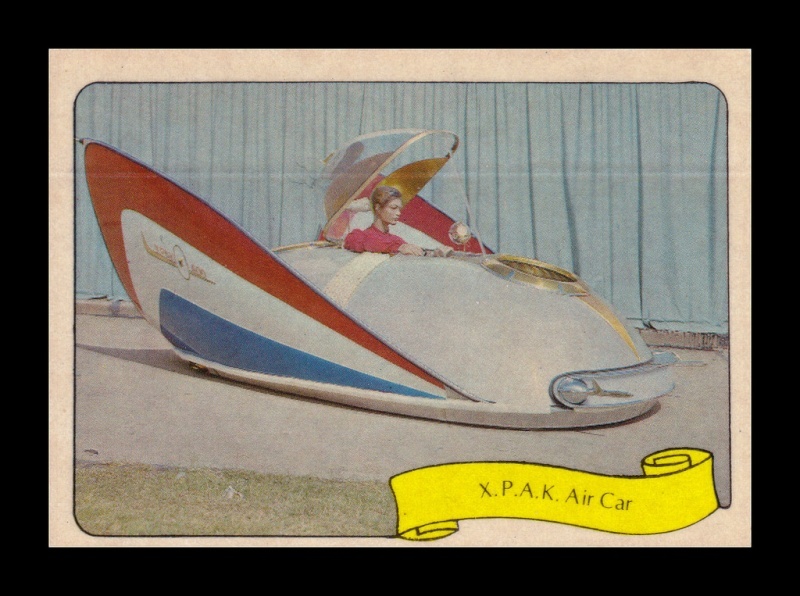 "Barris designed this car to ride on a cushion of air, powered by dual jet aircraft starting motors and 15" fans, it has neon tail lights, fluorescent head lights and a symmetrical-winged body." 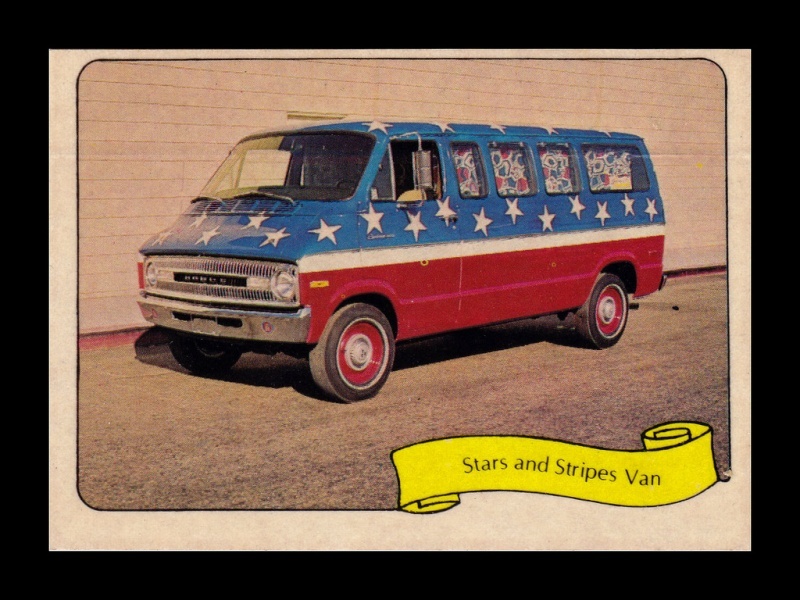 "This U.S.A. traveling Dodge Van has mag styled appliance wheels plus a unique stars and stripes interior with metalflake red, white, and blue pearl paint. Added chrome was installed on front and back." "This creation was used in the Fabian Funicello movie. 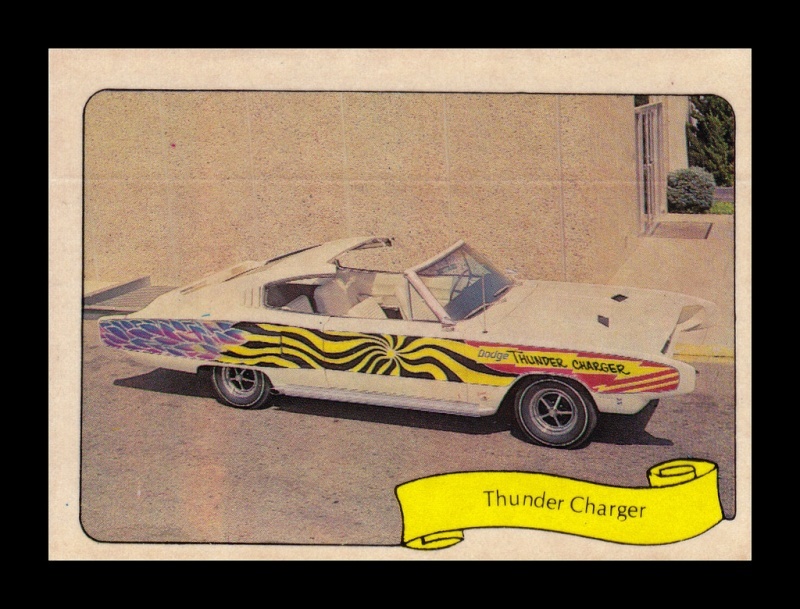 George Barris started with a Dodge Charger, and then added a cantilever top, extended front end fenders, and lengthened rear end. 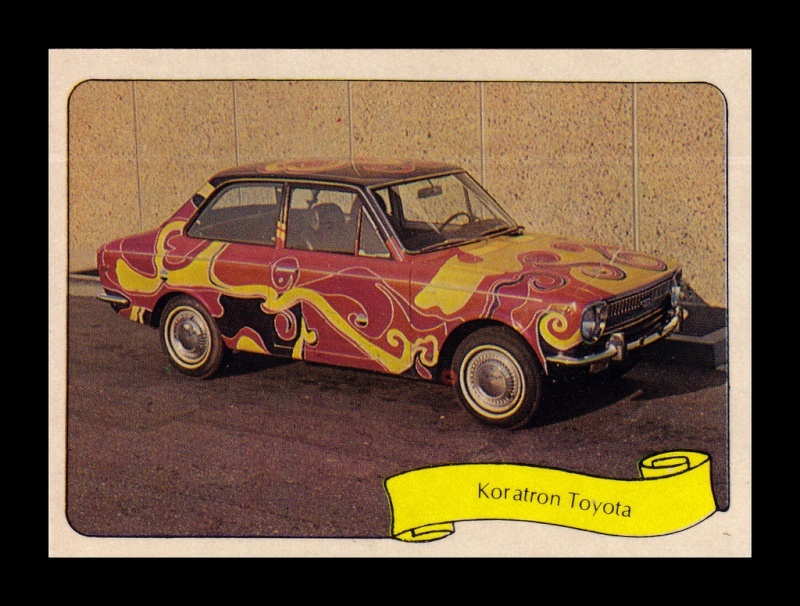 The car was painted in psychedellic colors." 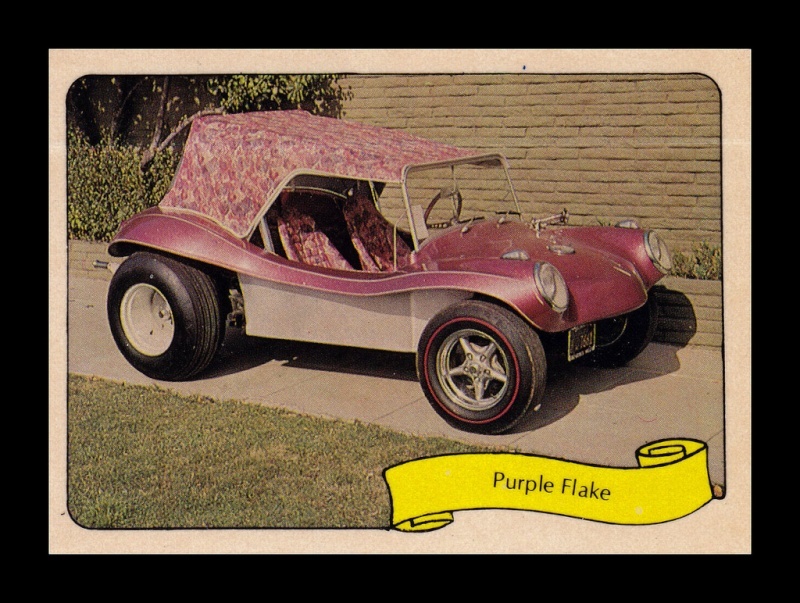 "This combination street and dune buggy has a purple matalflake fiberglas body with a flower covered vinyl top and interior. The power comes from a hot Porsche engine, and also included are big desert dog, off-road tires and mag spoke wheels." This Kandy Apple Red Ford Tudor was channeled 10" over the frame for lower ground effect. All fenders were sculpted with concave panels over a 396 Chevy engine and Hurst shifter." "A TV Dracula star rides in this Volkswagen Van equipped with super stock tires on appliance wheels. 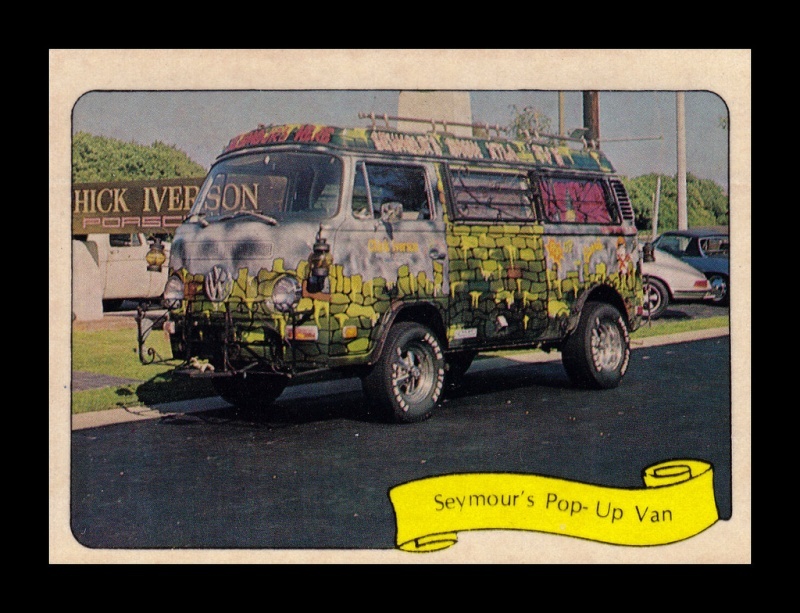 A ghoulish scene at a graveyard is hand painted on this Chick Iverson van." "A big 440 cubic inch Buick engine was used in this off-the-road vehicle. 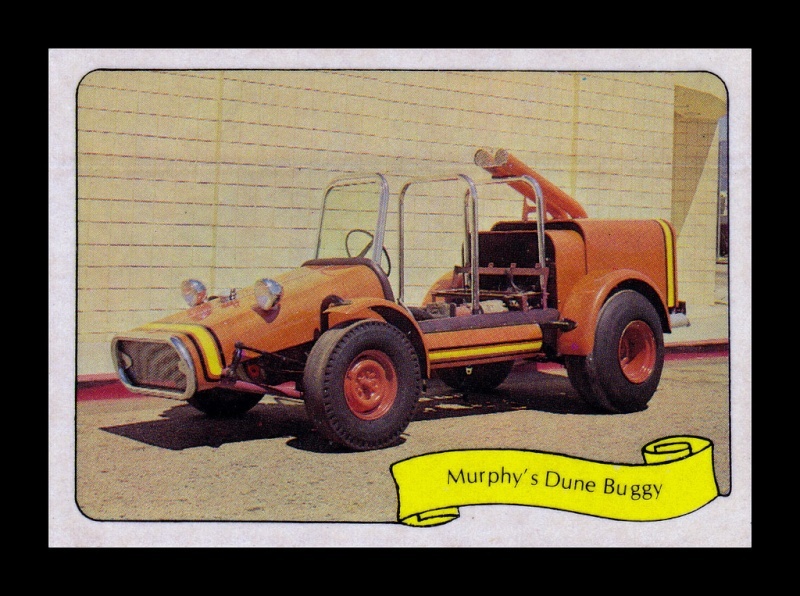 The buggy has an all-steel body and frame rails, and an extra high air scoop is used to clear the bellows of dust raised in the dunes!" 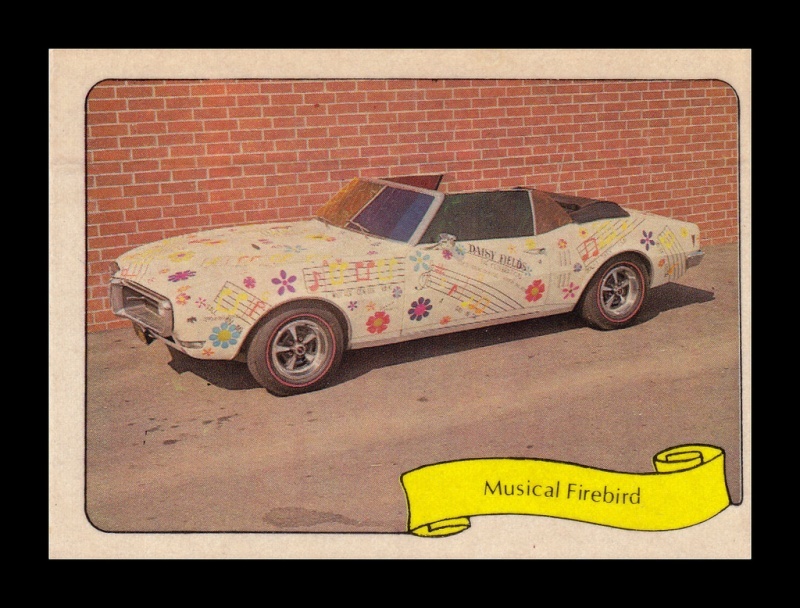 "Right out of the "Romp" TV series comes this unique Pontiac convertible painted with the complete musical score used by the famous rock group, Celebration. The wheels are mags with wild, wild tires." 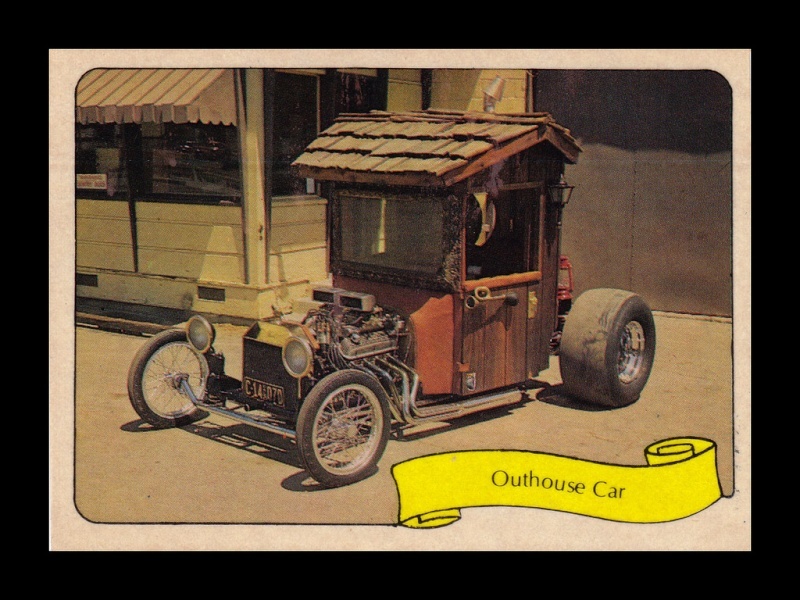 "A natural wooden outhouse was used for this Hot Rod of the Year. The complete body is made from wooden shingles, and the inside has outhouse seats and a cuckoo clock." 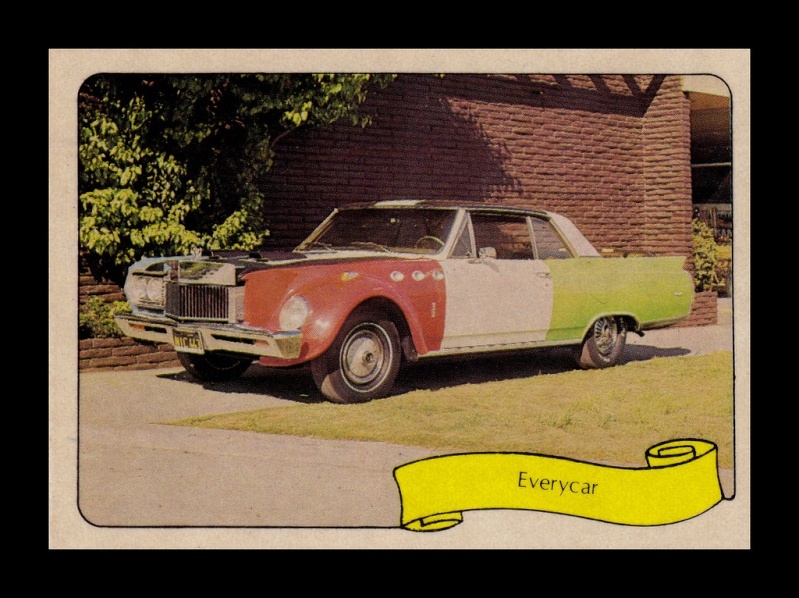 "This wild car was used by Elvis Presley in the box office hit "easy Come, Easy Go." The car is powered by a Ford Mustang engine and the upholstery is covered with a plush fur." 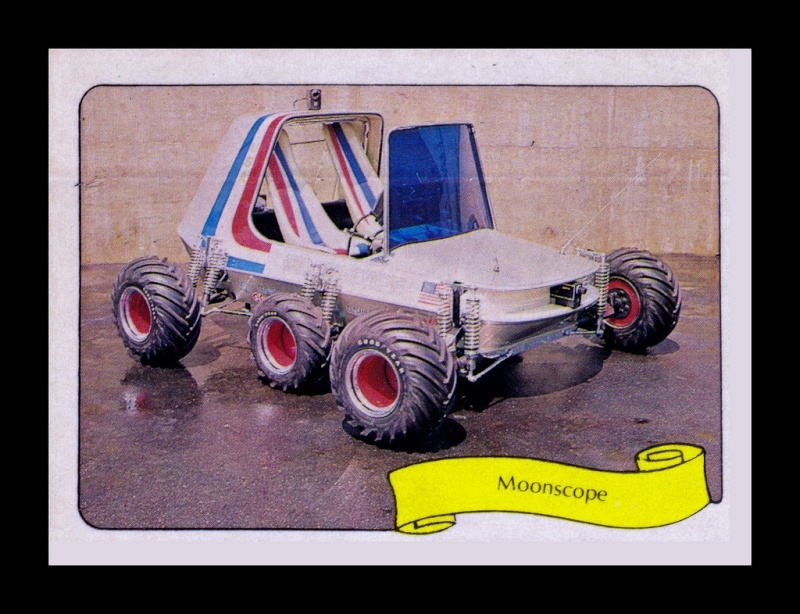 "This electric-powered Cushman cart represents an ideal moon cart with six wheels and cross-grooved tires, plus 12 spider-like shock coils. There are three TV monitor screens plus a camera to scan the terrain." 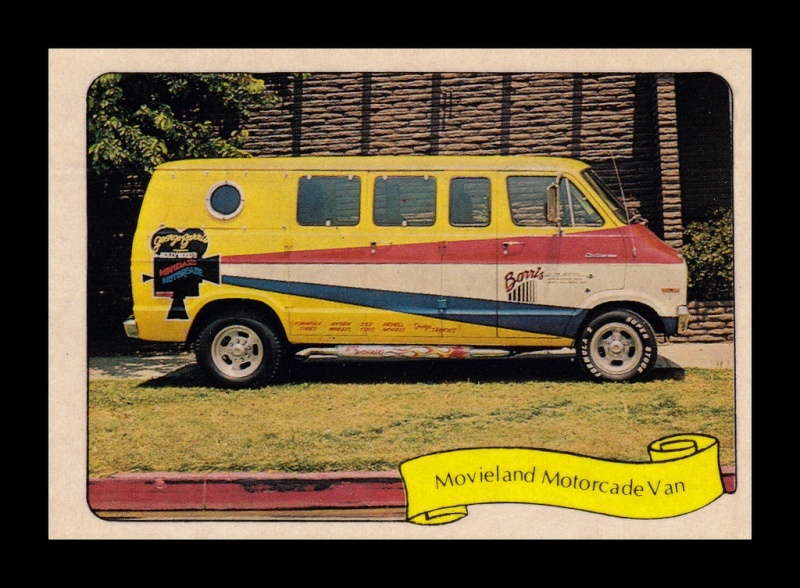 "This completely customized Dodge van is the official car for Hollywood MOTORAMA, "BARRIS CARS OF THE STARS" exhibition with A/P wheels, super stock tires, KC lights, Cal custom splash fenders. It's red, white, blue, and yellow with Big Richard side pipes and a top air vent." 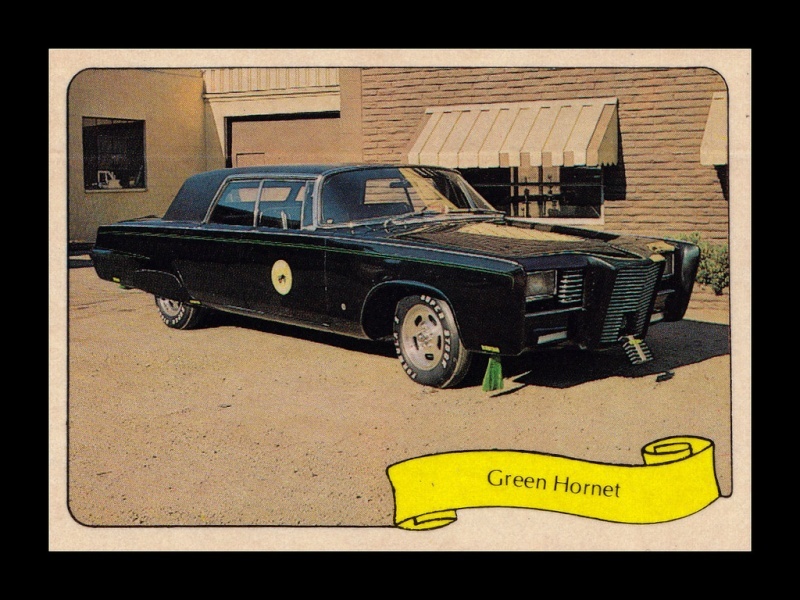 "This famous TV crime fighter's car is equipped with gun ports, computer phones, oil spreaders, nail sweepers, rockets, green gas smoke, radar, dual bullet deflectors, plus super stock tires." "The wildest colored paint in 22 different shades of pearls and Kandies finished with fine hand pinstriping. A give away premium car, it's been displayed in international auto shows. Quad stereo, a tach and special wheels make this a Barris standout." 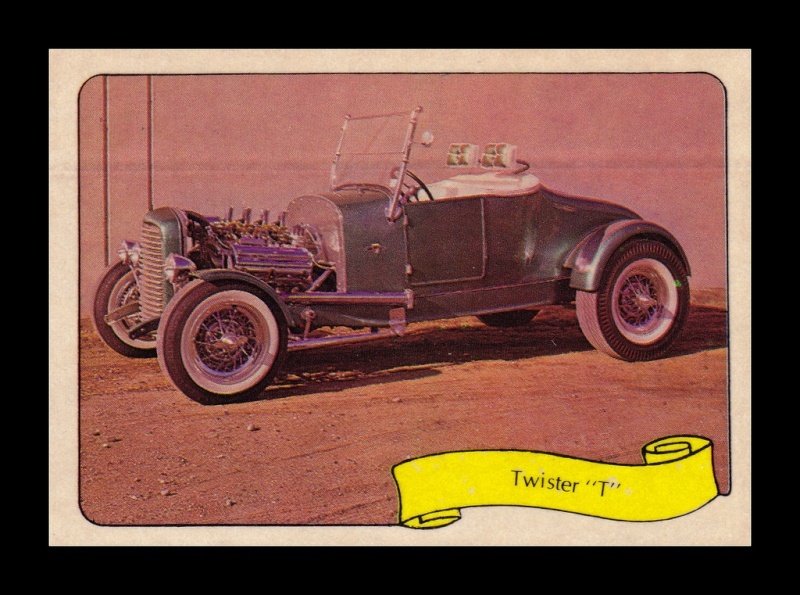 "A 1930 Model A was chosen for the Thaxton contest TV winner using a big Buick engine with MT manifold and carbs. The body is channeled 10" over the frame for lower effect. 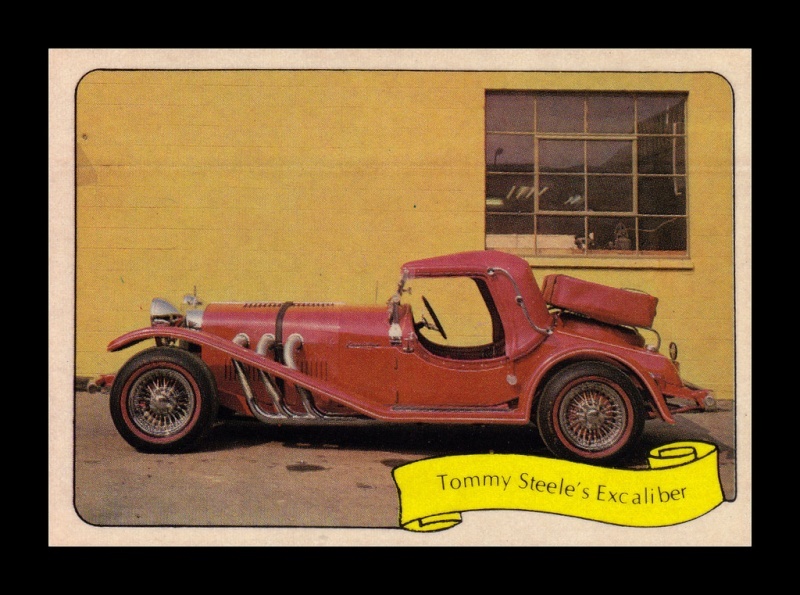 The Kandy apple red paint job and black leather interior are super special." 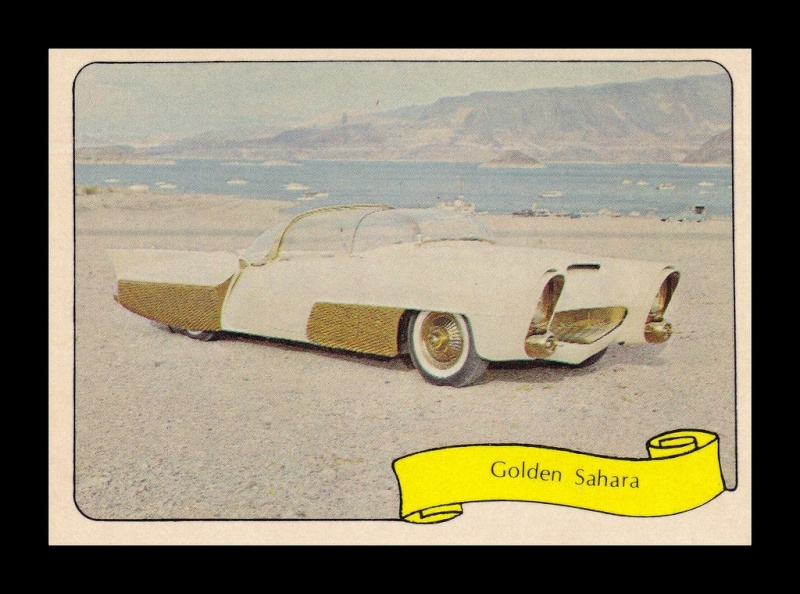 "The lime metalflake and yellow pearl hockey stick design with cycle styled fender caps won this George Barris classic the Science and Mechanics Magazine "Car of the Year." Powered with a 1500 VU Engine, it's loaded with Cal Custom performance equipment. 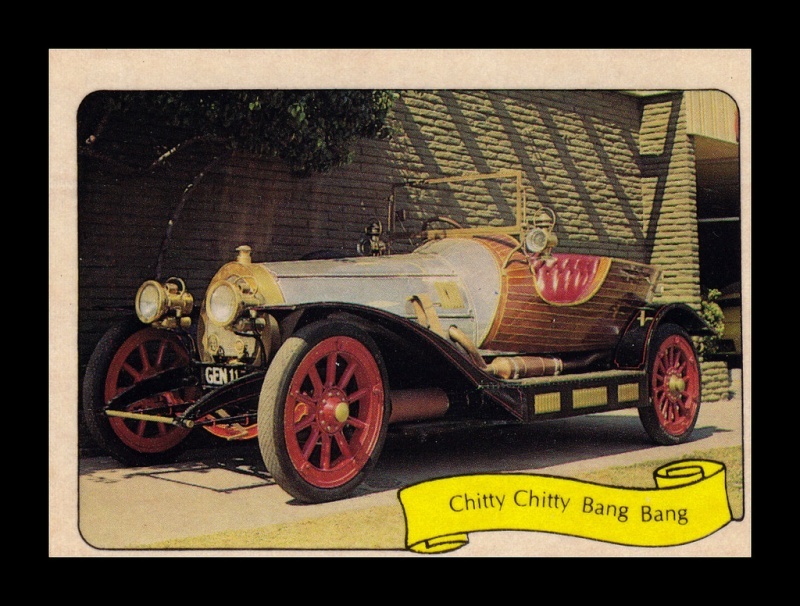 "One of Barris' favorite creations, this was used in the movie "Cinderfella" starring Jerry Lewis. Complete driving operation is by remote control electronics, including steering, closed circuit TV, doors plus start and stop. Steel sculpture body with glass blown dome top, gold plated trim and gold interior. 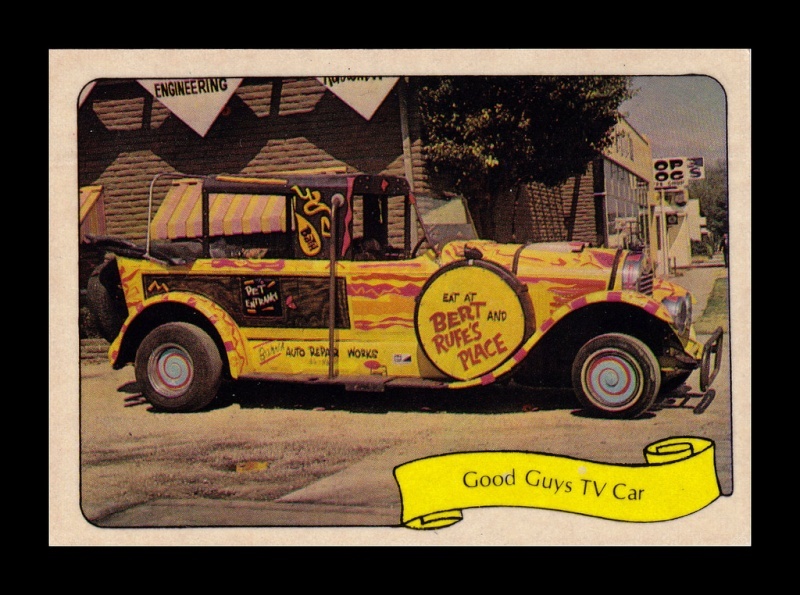 "This antique Lincoln was the taxicab in Bob's TV show and was duplicated as an MPC model kit with different wheels and tires for lopsided riding. It's got turnstile bucket seats, an umbrella, and an anchor for brakes. 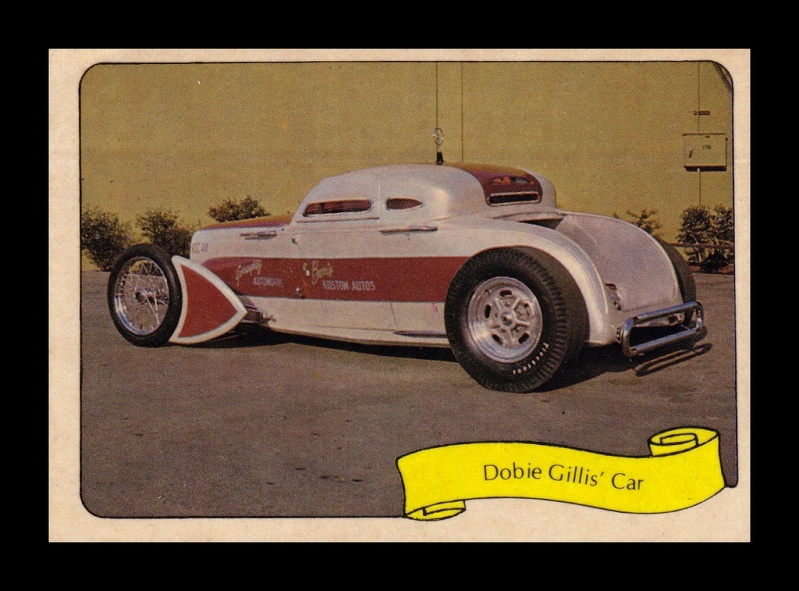 "This wild Model A speed coupe was created by Barris for the Dobie TV series. A huge 500 horse hemi engine with fuel injection lurks inside this white and orange pearl body that's been channeled, sectioned and chopped." " Fifty-nine different car parts were used to make up this unusual creation. 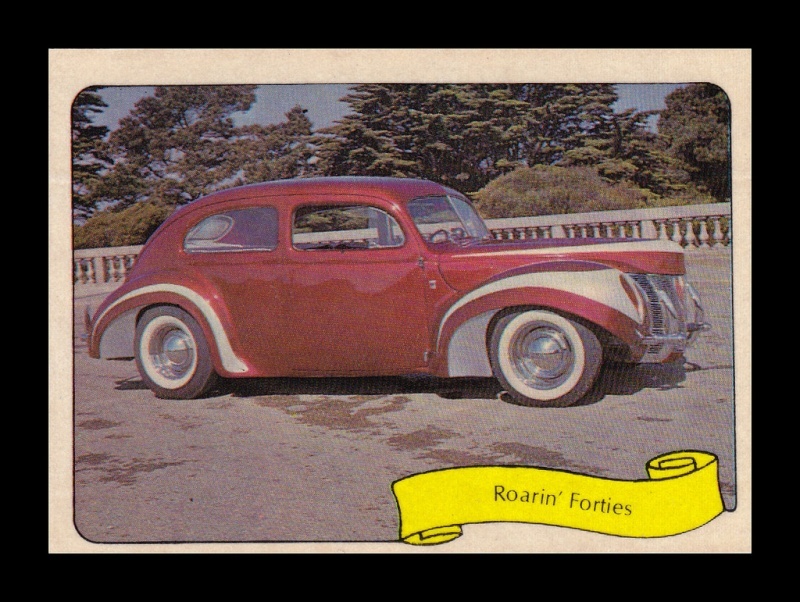 A chevy base was used and then Customizer Barris added fenders from Plymouth, Mercury, VW, and Cadillac. A Ford bumper, a cougar spoiler, and 52 other car parts." "This two passenger Corvette powered roadster was chosen by the TV and movie star for his show. It's furnished with a custom padded vinyl lift-off top with matching luggage mounted on the rear rack." "This hand built classic was created for the movie of the same name. The car has brass headlights, super big tires, outside exhausts coming from a Ford engine, and a wood boat tail section." 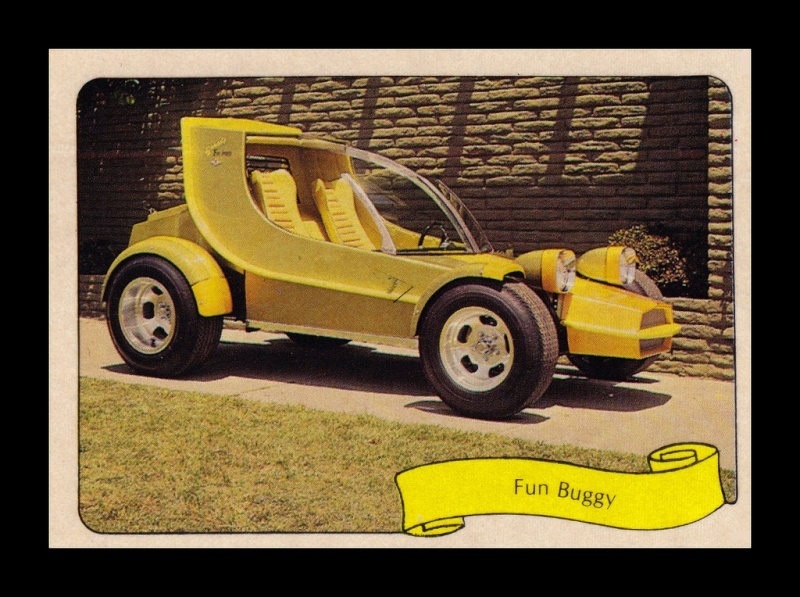 "Hobo Kelley uses this wild streamlined dune buggy for her TV show and street driving. 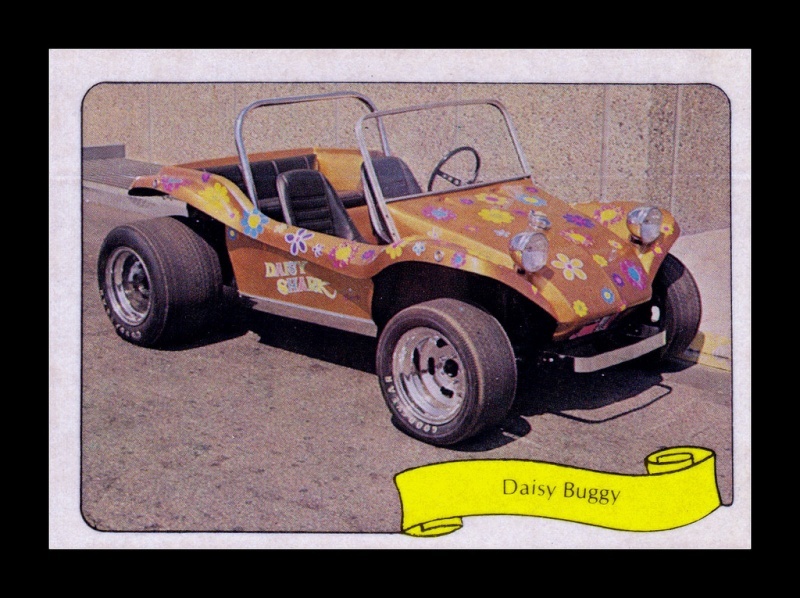 The metalflake body has oodles of daisies throughout plus mag wheels, desert dog tires, a Porsche engine and roll bar."